A refreshed Atlanta Dream is optimistic for the upcoming season. Photo gallery of the Mercury's first practice today. Training camp round up from the league. After a year away, Shoni Schimmel is back with the Liberty. A "kidchella" summer could be big for Diana Taurasi and the Mercury. Danielle Robinson is settling into her role with the Lynx. Lindsay Whalen will learn to balance life as a player/coach. Ex-Gopher Carlie Wagner is taking a shot with the Lynx. The Oregon Ducks enter the offseason determined to get to the Final Four. Ball State star point guard Carmen Grande is transferring. Pitt's leading scorer and rebounder, Yacine Diop, will transfer to Louisville. Q&A with Central Michigan coach Sue Guevara. Jennifer Roulier-Huth is the new head coach at Northern Colorado. DePaul coach Doug Bruno's contract has been extended through 2023-2024. The assistant coach spot at Texas will be filled by none other than Longhorn great Tiffany Jackson. New Canisius coach Scott Hemer found it hard to leave his job at State University College. The Dallas Wings opened camp with new defensive weapons. The Lynx are carving out a place in sports history. Today they opened camp with new faces and returning stars. Storm coach Dan Hughes is eager to begin training camp. Getting to know the Fever training camp roster. The Sun open camp with new faces. Marie Gulich moves on to the WNBA with a new mentor in Brittney Griner. Isabelle Harrison will take a medical leave of absence from the Las Vegas Aces. Ex-UNLV star Brooke Johnson is excited for Aces camp. Kristy Wallace looks back on her stellar Baylor career. The schedule never slows for Mississippi State coaches. Mistie Bass wants coaches to encourage their players to study the WNBA. Barbara Farris has left her high school coaching job again to be an assistant coach for the New York Liberty. JMU has broken ground on their new basketball arena. It will be ready in the fall of 2020. The most winning coach in NCAA history, Robyn Fralick, was a high school star player. The Las Vegas Aces enter training camp with a new name and new talent. The Liberty are preparing to play far from many of their fans, at the same time they are gearing for a deep playoff run. The Lynx open the season fueled by one thing they don't have: back-to-back titles. More on the league's new uniforms, and how they fit better. Diana Taurasi is adapting to being a parent. Lexie Brown's ascension was a family affair. The Liberty has announced its coaching staff. Transfer Lou Brown can "stretch the floor" for the Lady Vols, coach Holly Warlick says. Transfers will give West Virginia a new look in 2019. Boston College transfer Ella Awobajo has landed at Hartford. Lindsay Whalen has a player-coach role model in Dawn Staley. Being on both sides of the whistle. Lauren Jackson has hinted at a return to the court in Australia. They were designed with the women's game in mind. USA Basketball continues their search for Sue Bird's successor. Bird isn't just a legend for the Storm - she's a rock for Team USA. Expanding Pat Summitt's influence of female leaders motivates son Tyler to start business. The National Team's roster is set for tomorrow's exhibition game against China. Sights and sounds from training camp. A chance to play in the WNBA? That's all Tyra Buss ever wanted. WNBA hall of famer Sue Wicks advises students to follow their dreams. Lynn Hickey is the new athletic director at Eastern Washington University, after serving as an interim head. Southern coach Sandy Pugh is in talks to become Prairie View's next head coach. Larry Tidwell is the new chief of staff at Texas Tech. McNeese State's new assistant coach of Patrece Carter. UT-Arlington associate head coach Kristin Cole has resigned to spend more time with her family. The Commission on College Basketball today released a report making several recommendations for sweeping changes in men's basketball. The NCAA will begin work on implementing the complex reforms. The Atlanta Dream have had an offseason of change. Candace Parker is finished with USA Basketball. Sun guard Rachel Banham is happy, healthy and ready to go. Loryn Goodwin relied on faith to persevere through challenges and fulfill a dream. Connecticut has waived Kelsey Griffin due to injury. Let these men tell you how tough the women's game is. USA National Team training camp got underway today with renewed focus. Day one news and notes. Skylar Diggins-Smith could fulfill a need for USA Basketball. Who's coming and who's going at South Carolina. Anriel Howard is close to making a transfer decision. Roichelle Marble is leaving Wisconsin for Colorado State. Chloe Jackson, a graduate transfer from LSU, has joined Baylor's team. Tennessee has added Washington State grad transfer Louise Brown. Kennedy Leonard is focused on Colorado's success. Virginia coach Tina Thompson has worn many hats in her basketball career, but "mom" stays on top. Alex Simmons is the new head coach at Gardner-Webb. Alaura Sharp is Presbyterian's new head coach. South Carolina and Mississippi have each offered a scholarship to a seventh-grader. WNBA players are trickling into their cities this week in anticipation of the beginning of training camp Sunday. And in the meantime, WBB news is scarce. The Mercury have announced their local TV broadcast schedule for the year. Interview with Sun draftee Lexie Brown. Kaila Clark is transferring from Navy to Richmond. Besides Kelly Roysland, Minnesota coach Lindsay Whalen has named Carly Thibault-DuDonis as her new assistant coach. UMMC Ekaterinburg won the Euroleague final four. The team stars Maya Moore, Emma Meesseman, Kristi Toliver and Brittney Griner. The Oregon Ducks won the 3X3 national championship title. Twenty facts about the 20-year-old Minnesota Lynx. Kayla McBride is excited for life on and off the court. Aces draftee Park Ji-soo is coming to the U.S. tomorrow. The improvement of returners will be key for Colorado. The league recaps the biggest offseason moves. Keep up to date with the latest transactions. South Dakota coach Dawn Plitzuweit's contract has been extended through 2020-2021. UTRGV coach Larry Tidwell is resigning to become the chief of staff for Texas Tech WBB. Quinnipiac assistant coach Mountain MacGillivray is the new head coach at LaSalle. The preliminary round of 3X3 play is complete. NBA commissioner Adam Silver says one of the WNBA's main problems is getting young women to pay attention to it. Silver also suggested moving the season, and ESPN says "show me the money." I still say the league could be taking care of some basic things and be more successful off top. The draft class is ready to take the next step. The Mercury added rebounding when they chose Marie Gulich. Candace Parker is featured in basketball siblings. Kansas State guard Shaelyn Martin is transferring schools and changing sports. South Carolina has added a 1.5 million incentive for Dawn Staley to stick around. Lindsay Whalen's double-duty as a coach and player is intriguing, but is it feasible? Clemson has added Shimmy Gray-Miller as an assistant coach. Tina Thompson and Lindsay Whalen are leading a wave of female coaching hires. Thompson impressed Virginia's hiring committee immediately. Whalen has the perfect role model in Dawn Staley. Central Michigan coach Sue Guevara will earn at least $340,000 annually under her new contract. Miami Ohio coach Megan Duffy has signed a contract extension through 2022-2023. New Pitt coach Lance White is ready to work. NC State assistant coach Gene Hill is the new head coach at Georgia State. Mary Evans has fulfilled a lifelong dream in being named Valparaiso's new coach. Lindsay Whalen has hired former Gopher teammate Kelly Roysland to assist her at Minnesota. Boston College coach Joanna Bernabei-McNamee is bringing her two assistant coaches from Albany with her. Nneka Enemkpali is a new assistant coach at UCSB. UConn's new assistant coach is former grad assistant Jasmine Lister. New Washington State coach Kamie Ethridge is bringing Laurie Koehn with her as an assistant coach. Erin Grant is back at Texas Tech as an assistant coach. LaNitra Perry will return to Toledo as an assistant coach. Alex Delanian returns to Hawaii as an assistant coach. Wisconsin's new assistant coach is Kayla Tetschlag. Jauwan Scaife is Murray State's new assistant coach. Vanderbilt transfer Kayla Overbeck has landed at USC. The Division I council has adopted new recruiting legislation: New rules aim to make college athlete recruiting experience similar to student body’s. The Council also voted to allow recruiting visits in an athlete's junior year of high school. Wilson Sporting Goods and the NCAA have extended their partner ship through 2020-2021. Arike Ogunbowale's "Dancing With the Stars" gig forces the NCAA into a tricky two-step. A brighter day: How Imani McGee-Stafford found light in the darkest of times. Top recruit Samantha Brunelle was ready to commit to Notre Dame before they won the title this month. Analyzing rosters heading into training camp. Skylar Diggins-Smith takes us behind the scenes of her new Body Armor sports drink commercial. Seattle mayor Jenny Durkan played Sue Bird in HORSE. New Virginia coach Tina Thompson is excited to work with center Felicia Aiyeotan. Rennia Davis says Tennessee's offseason has been "more intense." Virginia's AD says Tina Thompson is "exactly what we need." Thompson is inexperienced but admirably self-aware. Lance White is Pitt's new coach. Southern Utah's new coach is Tracy Sanders. Coach Amy Williams and Nebraska's AD are "completely on the same page." Nikita Lowry Dawkins is Texas Tech's new associate head coach. Alcohol sales at the championship level have been approved by the Division I council. The 3X3 rosters have been set. Candace Parker will pay $400,000 in alimony to former husband Shelden Williams. Nicki Collen is bringing her Marquette experience to the professional level. A guide the the Euroleague final four. Ups and downs and ratings for 2012-2017. The Gamecocks will look different next year but plan to have the same success. "Defining family": American travels to player's hometowns. A look at Michigan's finances. Tennessee freshman Rennia Davis was named the top rookie by her teammates. South Carolina guard Victoria Patrick is transferring. Utah Valley players cite a "toxic environment" for early departures. Where are the women in college coaching? Boston University has hired alumni and longtime UConn assistant coach Marisa Moseley as its new head coach. Chris Kielsmeier is Cleveland State's new coach. Tina Thompson is the new head coach at Virginia. Kamie Ethridge is Washington State's new coach. Tomeika Reed is Jackson State's new coach. Duke coach Joanne P. McCallie begins a two-month leave of absence today to get treatment for a kidney ailment. Central Michigan has extended the contract of coach Sue Guevara through 2022-2023. Everybody loves Lindsay Whalen. That doesn't mean Minnesota's decision to hire her as coach comes without risk. JR Payne is excited for the future of Colorado. Michigan Tech coach Kim Cameron has stepped down to pursue a DI coaching opportunity. Arike Ogunbowale wants to get back to winning. The NAIA will combine divisions into one beginning in the 2020-2021 season. The evolution of WNBA uniforms. Check out the awesome retro picture. Last week's draft had the highest viewer ratings since 2014. Tanisha Wright is preparing, once again, to suit up for the WNBA. Myisha Hines-Allen's new coach didn't need her, but drafted her for her toughness. Ariel Atkins’ efficiency, athleticism, and work ethic are what the Mystics need at the wing. The Liberty have drafted Barack Obama's niece, Leslie Robinson from Princeton. Q&A with WNBA draftees Maria Vadeeva and Raisa Musina. Elena Delle Donne and former vice president Joe Biden ran into each other on a golf course this weekend. The roster is set for the Women's National Team April 26 game in Seattle. Aina Ayuso is leaving Oregon - the third player to depart. A year-long hiatus led Amanda Butler to Clemson. Great piece by Dan Fleser on the former Lady Vol, who passed away yesterday. No. 1 class of 2019 prospect Samantha Brunelle has committed to Notre Dame. A'ja Wilson says goodbye to Columbia as the prepares for the challenges of the WNBA. Five things to know about the Sky's Gabby Williams. Kia Nurse looks to be a role model in the WNBA. A strong draft class has the future looking bright for the Sky. Curt Miller's next goal is preparing the Sun to be title contenders. Sparks draftee Maria Vadeeva is the first player younger than the league itself. At Oregon, Anneli Maley will transfer to TCU, and Sierra Campisano has asked for a release. Khaléann Caron-Goudreau will not return to Texas for her final year of eligibility, opting to transfer to a Canadian university. Two from Vermont are transferring. Washington State transfer Nike McClure has landed at New Mexico. Q&A with West Virginia coach Mike Carey. Minnesota's AD expects new coach Lindsay Whalen to do well in recruiting. Australia beat England, 99-55, to win the Commonwealth Games title. Liz Cambage was ejected during the matchup. Lady Vol great and former assistant coach Daedra Charles-Furlow died today at 49 from breast cancer. ESPN commentators share their thoughts and make predictions. The draft inspired some young girls last night. A'ja Wilson is ready to stage her second act. Diamond DeShields knows she has plenty to prove in the WNBA. DeShields is ready for a fresh start in Chicago. Under Sue Bird's guidance, Jordin Canada looks to become the next great Storm point guard. Inside Victoria Vivians' draft experience in New York. Van Chancellor sings Vivians' praises. Jill Barta reacts to being drafted. Draftee Mackenzie Engram has an NFL-playing brother. Why it's even difficult to compete as a WNBA agent. Tamika Catchings talks about entering the WNBA. ....made history with viewership and attendance numbers. Arike Ogunbowale will appear in the athlete-only season of "Dancing with the Stars." The NCAA has broken its own rules for DWTS, and that's progress. Ogunbowale plays a news dude one-on-one. Auburn's Bria Johnson uses poetry to serve the community. Dana Evans is looking forward to next season at Louisville. Is Danni Williams considering a transfer from Texas A&M? Myriama Smith Traore will transfer from Marquette. Valparaiso's new coach is Mary Evans. Changes are coming for Kentucky's coaching staff. New Gophers coach Lindsay Whalen says she always envisioned herself coaching. Geno Auriemma shares his thoughts on Minnesota's hire of Whalen. New Clemson coach Amanda Butler talks about her coaching philosophy. WNBA teams reload on draft night according to plan. Oh, Canada! Storm nabs UCLA star point guard with fifth pick. The WNBA invitees came in as mostly strangers and left as sisters. Earlier today, the Atlanta Dream traded Bria Holmes to the Connecticut Sun for the 15th pick in tonight's draft, and a 2019 pick. The WNBA unveiled new Nike jerseys today. Taking stock of LSU basketball is a complicated task. NCCU adds four new players to their gutted roster. West Virginia is fully-loaded for next year. UConn's Katie Lou Samuelson had successful ankle surgery this morning. Chloe Brooks will play for her father at Virginia Tech. Desiree Keeling to transfer from Rutgers. Grayson Bright will transfer from Texas Tech. Minnesota has hired Lindsay Whalen as its new head coach. Clemson's new head coach is Amanda Butler, formerly coach at Florida. Ravon Justice is the new head coach at Sam Houston State. Alecia Wilson is Pacific's new head coach. Semeka Randall-Lay is a new assistant coach at Cincinnati. Mike Neighbors reflects on his first year at Arkansas. The Women's National Team will face China in an exhibition game in Seattle April 26. This year's U18 team coaches are Natasha Adair, Jeff Walz and Cori Close. Five storylines to watch at the draft. The draft prospects arrived yesterday. Strategizing with the Fever for an historic draft night. The Sky is sitting pretty entering the draft, with the third and fourth picks. The Lynx, with their roster virtually set, are drafting for camp competition. They are also keeping an eye out for trade deals. And they remain mindful of their future. The Sparks are looking to build depth and add a post player. The Sun is looking to get it right tomorrow. Las Vegas Aces coach Bill Laimbeer says the first pick will be very easy. A'ja Wilson is a jackpot waiting to be won. Russia's Maria Vadeeva could be the steal of the WNBA draft. How will Azura' Stevens effect the draft? Stevens and Diamond DeShields are among the Sky's targets in the draft. Kelsey Mitchell is grateful to be there. Mitchell and her Buckeye teammates await their fate. Five things to know about Victoria Vivians. Where Jordin Canada and Monique Billings fit in. Canada is the best playmaker in the draft. When will Tennessee's Jaime Nared and Mercedes Russell be picked? Katelyn Flaherty and Tyler Scaife are draft hopefuls with New Jersey ties. Lexie Brown and Rebecca Greenwell are set for tomorrow. UConn's three stars are expected to be drafted early. Versatile Cal guard Mikayla Cowling looks forward to the draft. Imani McGee-Stafford reflects on the draft process. The league has kicked off their 2018 ad campaign with the emotional story of Skylar Diggins-Smith's comeback. How Christine Monjer is marketing the Las Vegas Aces. Bianca Cuevas-Moore has transferred from South Carolina to West Virginia. Chanette Hicks is leaving Virginia Tech. Tennessee's AD is working on a contract extension for Holly Warlick. Tom Garrick is the new head coach at UMass Lowell. Longwood will hire Rebecca Tillett as head coach. Akron coach Jodi Kest is retiring after 12 years. Howard Payne coach Meia Netter has resigned after five seasons. Marlene Sollings left the Gophers for "sleeping giant" Texas Tech. Again, UAlbany needs a new coach. Mechelle V's mock draft makes more sense than most. Reigning rookie of the year Allisha Gray gives advice to this year's 2018 class. How Wilson can make an immediate impact in the WNBA. Wilson knows where she's going. Options abound for Azura Stevens. Stevens' game is a perfect fit for the changing WNBA. Monique Billings awaits the draft. Ohio State coach Kevin McGuff discusses Kelsey Mitchell. Indiana's Tyra Buss hopes to be chosen in the draft. The Fever's future depends on the draft. With their roster mostly in place, Dallas can afford to be selective Thursday. Analyzing all the WNBA arenas. Can Clemson catch up to South Carolina? NC State is defying the odds. The University of Washington is now an Adidas school. Two players are leaving LSU. Two are transferring from New Mexico. Joanna Bernabei-McNamee is the new head coach at Boston College. Darnell Haney is Jacksonville's new coach. Thirty-five athletes will try out for the U17 team. The USA 3X3 world cup opponents have been revealed. Kara Lawson is on a Tennessee governor-appointed board of trustees. She was appointed this week. How far can Becky Hammon go in the NBA? Recruiting can be a chore for two-year schools. A'ja Wilson is ready to bring a new house into the WNBA. Wilson is ready for the draft. Kelsey Mitchell is coming to the WNBA to get buckets. Mitchell is expected to go high in the draft. Diamond DeShields has given the WNBA plenty to think about before the draft. Louisville's Myisha Hines-Allen can make noise at the pro level. OSU's Marie Gulich is preparing for the next phase of her career. Maya Moore has an air Jordan coming soon. Seimone Augustus was inducted into the Louisiana high school hall of fame. It was a banner year for the ACC. Indiana's Tyra Buss is proud of her legacy. Texas freshman Rellah Boothe will transfer to Northwest Florida State College. Boothe is looking for a fresh start in her home state. Why Mississippi State's Myah Taylor will become the new face of college basketball. Purdue sophomore Miracle Gray is transferring. A'ja Wilson thought about quitting basketball two years ago, when her grandmother died. Wilson was presented with the Naismith Trophy today. Marlene Stollings is leaving Minnesota to take the head coaching job at Texas Tech. Stollings' departure is reminisent of Brenda Frese's. The Chamique Holdsclaw documentary focuses on her mental illness journey. Of course women can lead men in sports. Ten defining moments of Notre Dame's championship season. UConn coach Geno Auriemma has gathered his team, and the 2018-2019 project has begun. Iowa State's gym rat, Bridget Carleton, isn't slowing down in the offseason. Geno Auriemma is at the center of a world analyzing Husky basketball. Sue Bird talks about A'ja Wilson. Tamika Catchings talks Lady Vols season, Pat Summitt and Final Four. What happens with chilled-out No. 9 prospect Destanni Henderson goes to play for Dawn Staley next year? Sophomore starting point guard Taylor Turney is leaving San Jose State. Former college hooper Brehanna Daniels is using basketball skills as a NASCAR pit crew member. LaChina Robinson and Rebecca Lobo preview the draft. Also looking ahead to Thursday is Bill Laimbeer, Pokey Chatman and Amber Stocks. New York Liberty draft preview. Meet Addison Potts, the eighth-grader committed to Missouri. Will UConn win another national championship? Can Ashland's dynasty continue with a new coach? A'ja Wilson has won the John Wooden Award. Arike Ogunbowale was on the Ellen DeGeneres show today. Jessica Kovatch of St. Francis broke the DI single-season record for three-point shots this year, with 141. Green Bay's Allie LeClaire and Jessica Lindstrom are preparing for pro careers. The Texas Sports Hall of Fame continues to take Nell Fortner everywhere. Yolett McPhee-McCuin is embracing the challenge of rejuvenating Mississippi basketball. Minnesota coach Marlene Stollings interviewed for the Texas Tech job. Ex-Virginia coach Joanne Boyle and her daughter are preparing for their time in Africa over adoption issues. Helen Higgs has stepped down from Whitworth College after 24 years. "She can scare a lot of people": what A'ja Wilson's likely WNBA coach Bill Laimbeer thinks of her. Players with Oregon ties will be represented in the draft. Nina Davis has found success and peace in her post-Baylor career. MaxPreps final top 25 rankings. AUSTIN, TEXAS - WNBA Star, Poet, Writer and Mental Health Advocate, Imani McGee-Stafford, adds published author to her burgeoning brand. 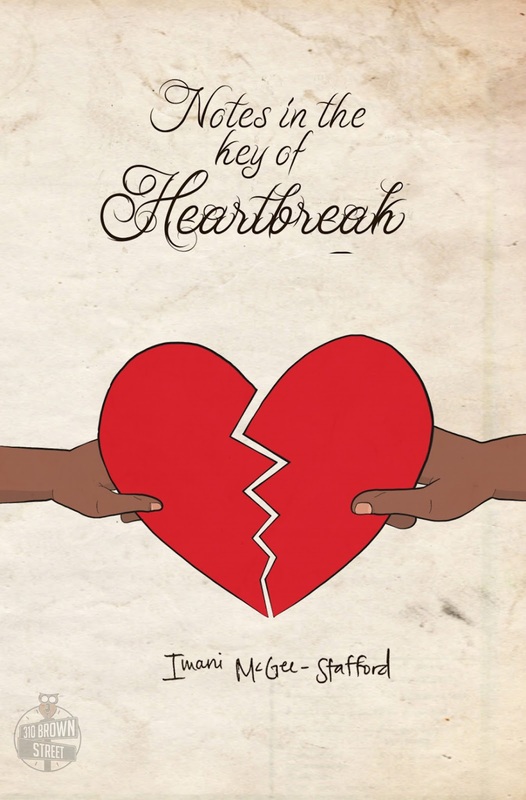 Notes in The Key of Heartbreak, a book of poems by the WNBA’s Atlanta Dream center standout, is the next chapter in McGee-Stafford’s remarkable journey towards becoming a true renaissance woman. As a child, McGee-Stafford was molested by a family member and raised in an abusive and negligent environment, spending many of her teen years depressed and suicidal. In 2012, she earned a full scholarship to the University of Texas at Austin, where she eventually received the support and mental health services she long needed--support that also ultimately equipped her with enough courage to share her story. “Some of us never do the work to make ourselves whole even though we all know that none of us can give what we don’t have,” said McGee-Stafford, who champions mental health through her speeches in corporations, organizations, and schools around the country. The Final Four shows the progress of women's basketball. The Ivy League will enhance their exposure with a long-term ESPN agreement. Gonzaga will stay in the WCC. Why Notre Dame can repeat as national champions. Nine games that defined UConn's season. What Mississippi State fans have to look forward to next season. Yale posted the most wins in program history this year. Western Kentucky's Tashia Brown is training for a possible pro career. Northern Colorado's Ali Meyer has overcome plenty of adversity. The parents of the NCCU players whose scholarships weren't renewed plan to file a lawsuit. Ole Miss has hired Yolett McPhee-McCuin as its next head coach. Melissa Kolbe has followed Michelle Clark-Heard to Cincinnati and will be assistant coach there. Ashland associate head coach Kari Pickens has been elevated to head coach. Bowling Green has hit a home run by hiring Robyn Fralick. The NAIA will vote on the number of divisions they'll have. Hoops and handbags: A "pretty epic" Auburn family story. League coaches and GMs tab A'ja Wilson as the first pick in the draft. WNBA free agency winners and losers. U17 coaches Vanessa Nygaard, Carla Berube and Steve Gomez will return to lead the team this summer. Erica McCall's in-depth account of her first year playing overseas. The records left by the two UCLA greats. The more women's sports are covered, the more popular they will be. The Final Four caused a blessed hangover. Rob Knox's Final Four retrospective. I mentioned this on twitter twice this season and got a bit of resistance both times, but ESPN agrees with me: playing in the AAC hurts UConn in the postseason. The Irish are on the cover of Sports Illustrated. Notre Dame's 2001 championship team finally has company. Reality bites UConn and coach Geno Auriemma. South Carolina's Alexis Jennings opted to stay and not enter the draft, as did Bianca Cuevas-Moore. At least seven of the NCCU scholarships revoked last week will be reinstated. Three are transferring from Vanderbilt. Five are leaving Colorado State. It's being reported that Sierra Campisano is transferring from Oregon. Three are leaving Montana State. Robyn Fralick is the new coach at Bowling Green. Her record at Ashland is 104-3. The new coach at UIC is Tasha Pointer. Gardner-Webb coach Rick Reeves is retiring. Victoria Vivians has her sights set on the draft. Elizabeth Williams has signed a multi-year contract extension with the Atlanta Dream. Yes, it was the best ever. Columbus garnered praise for its hosting job. Family for all teams, in pictures. Arike Ogunbowale put an unforgettable stamp on the Final Four. From Nebraska to Notre Dame, Jessica Shepard saw her title dreams come true. Notre Dame arrived home to a celebration today. Today's Final Four is a far cry from that of yesteryear. What to expect from Mississippi State next season. The Bulldogs got a warm welcome home today. Mississippi State looks to be resilient after a second straight title loss. The Bulldogs had an impact on fans. It's not too early for Notre Dame fans to dream about next year. Idaho State is the most-improved field goal shooting team of the year. Azura Stevens will skip her final year at UConn to enter the WNBA draft. Texas A&M's Anriel Howard may transfer. Forgot to post this the other day: Roshunda Johnson balances motherhood and being a student-athlete. Muffet McGraw was noncommittal when asked if Notre Dame would visit the White House, if invited. Oklahoma coach Sherri Coale on women's basketball: "It’s a mistake to try to be like the men." New UMaine men's assistant coach Edniesha Curry isn't motivated by her trailblazing status. Vermont is investigating the verbal conduct of coach Chris Day. The final poll of the season. The W breaks down team needs 10 days before the draft.